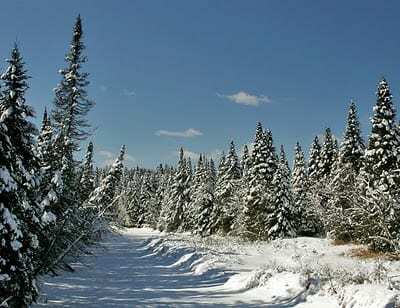 There isn’t much skiing left around Lake Placid, so on my lunch hour Wednesday I went for a run on the loop trail at Henry’s Woods. I found what I expected to find: glare ice and very hard packed snow. 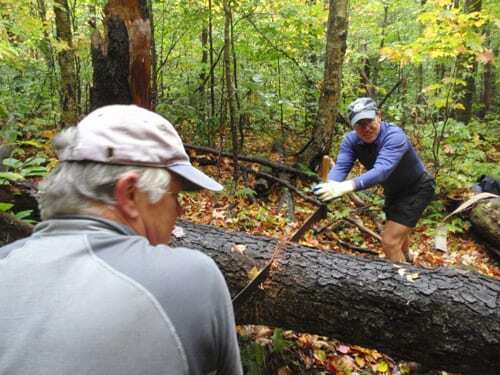 The good news is that the trail will be skiable again with a little bit of snow. I put nine screws into each sole. The bad news is that, until we get more snow, trail running can be treacherous unless you have traction devices on your shoes. MicroSpikes or Yaktrx Pro are two possibilities, but they cost money. There is another option for cheapskates like me. 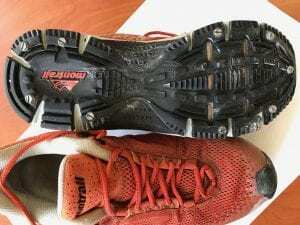 Several years ago, I bought some machine screws at a hardware store for a few bucks and screwed them into the soles of an old pair of trail-running shoes. I used nine screws for each shoe, placing them along the outer edge of the sole. This wasn’t an original idea. I read about this DIY project online somewhere. I believe the pattern of screws depicted in the photo is the pattern I found online. 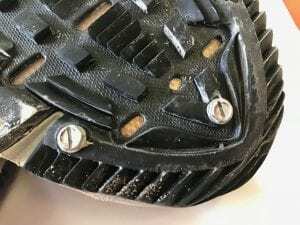 Before writing this post, however, I googled “screws for winter trail-running shoes” and came across other patterns. Machine screws like these can be bought in an ordinary hardware store. What I can say for sure is that the shoes worked fine at Henry’s Woods, though even with screws in my soles, I had to use caution on the icy downhills. Since I am more of a skier than a runner, I seldom use my screw shoes, but they come in handy when there is a dearth of snow. If we do get snow again this winter, I’ll be back on my boards. 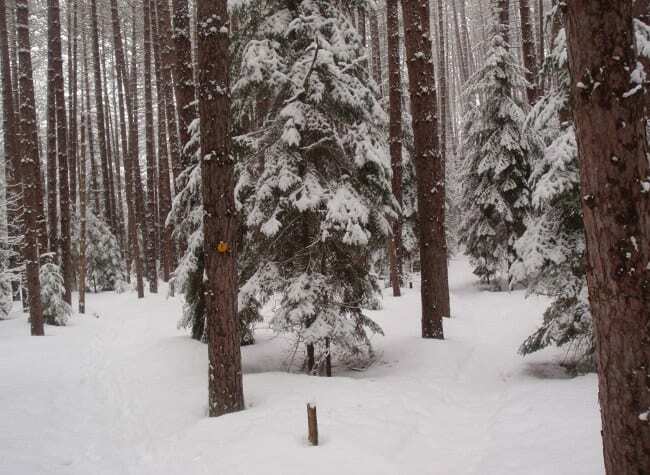 And I would ask runners out there not to posthole on trails used by skiers. Incidentally, there are screws specially designed for trail-running shoes. Click here to read a comparison between these screws and run-of-the-mill screws. If you’d like to make your own pair of screw shoes, there are a number of how-to blogs on the topic. Here is a link to start your research. And here’s another.